Well there you have it the Ambani sibling rivalry gives them both a position on Fortune’s Top 50 people who matter most list. As with the top 100 women’s list these lists seem to be done in a fashion that stirs up controversy and intrigue. Well I am not buying it… literally and figuratively. Not only because someone left my name off the list, but Indira K. Nooyi of Pepsi made both lists in the same month. Fine she may be talented, but I am the on pushing the India bull story forward. She’s pushing flavored water to the masses. Who matters more I ask you? 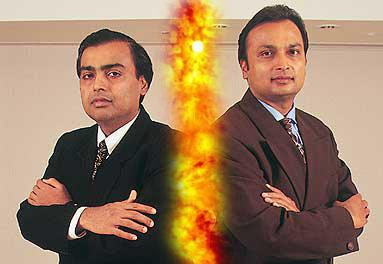 So back to the Ambani brothers. I’m not sure why the two dislike each other so much, but it seems to me they are behaving like spoiled brats. Family shouldn’t fight and they definitely shouldn’t raise the issue in public. I don’t care if daddy liked one of them and disliked the other, take it like a man and move on. Battle of the Billionaires doesn’t seem all that interesting to me. So gentlemen, stop being tough guys for 2 seconds and make up. I’m certain Dhirubhai wouldn’t approve and I am even more certain he wouldn’t approve of that monstrosity of a home you’re building Mukesh. 4500 sq meters of living space on 27 floors? Do you plan to live on one floor a day on each day of the month? I am starting to feel like my 15,000 sq ft bungalow outside of Mumbai is petite.